Conference: "Moving on Beyond the 'Land of the Three Cultures': Re-Thinking Medieval Iberia"
Photo credit: The front image for this symposium is a detail from the manuscript called the Vidal Mayor (Los Angeles, The J. Paul Getty Museum, Ms. Ludwig XIV 6, fol. 242v). 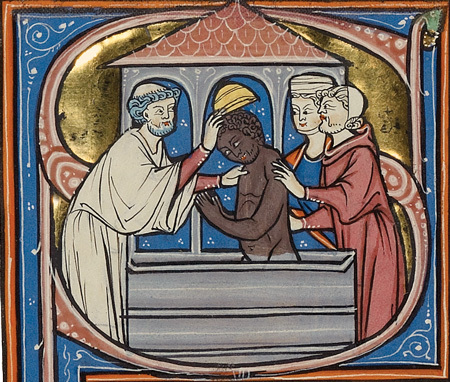 Artist Unknown, Initial S: The Baptism of a Muslim, ca. 1290-1310. Tempera colors, gold leaf, and ink on parchment, 36.5 × 24 cm. This two-day conference seeks to challenge the received notion of medieval Iberia as a “Land of the Three Cultures”—Christian, Muslim, and Jewish—by questioning the relevance of this construct. Was medieval Iberia a land of only three cultures? Why not four, five, six, or more? Despite recent calls to do away with the convivencia and reconquista paradigms, the question of how to proceed from here remains. This conference seeks to address the implications of cultural-religious approaches to the study of medieval Iberia by asking: How do we move beyond the “Land of the Three Cultures”? Do we want to? Can we? What are the alternatives? The conference will be structured around four consecutive sessions dealing with Technology and Material Culture; Law and Religion; Literature; and Language and Translation. A roundtable session will conclude the conference. The following scholars have confirmed their participation: Thomas Glick, Rafael Azuar, John Tolan, Brian Catlos, Benjamin Liu, Dayle Seidenspinner-Nunez, Robin Vose, Gerard Wiegers, Simon Doubleday, Thomas Burman, and Ana Echevarria Arsuaga. For more details, consult the conference website, or send email to mediberia@gmail.com. Sponsored by a Mellon grant through the Institute for Scholarship in the Liberal Arts, the Nanovic Institute for European Studies, and organized by Belen Vicens-Saiz, graduate student in the Department of History, in collaboration with Olivia Remie Constable, Professor of History and Director of the Medieval Institute.